The mantis shrimps, Order Stomatopoda, are the most flamboyant crustaceans, and only distant relatives of the decapods. They are primarily shallow water tropical animals and are abundant throughout the GBR. They are active, aggressive predators and often vividly coloured. Adults range in size from less than 10 mm to almost 400 mm. The body is elongate, with a short, shield-like carapace that does not cover the last three thoracic somites. 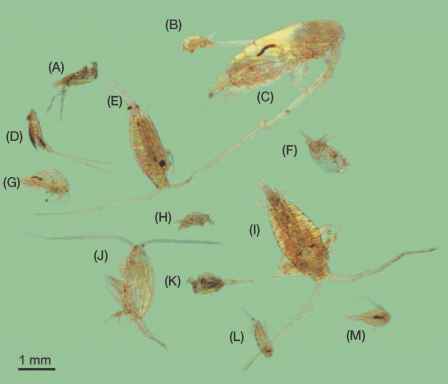 Unlike decapods, which either broadcast spawn or incubate the eggs on the pleopods, sto-matopod females carry the egg mass with their mouthparts until hatching. The most characteristic feature of stomatopods, however, is the greatly enlarged raptorial forelimbs used to catch prey. The raptorial claw of stomatopods resembles that of the insect, the praying mantis, in which the last segment (dacty-lus) folds like a jackknife against the preceding segment (propodus). However, instead of grasping prey like the praying mantis, stomatopods strike violently with considerable speed and force. The raptorial strike of the stomatopod is one of the fastest known animal movements, being completed within five milliseconds. Obviously, large stomatopods must be handled with great care. Stomatopods can be divided into two functional groups depending on how they use their raptorial claws during the strike. 'Spearers' (Fig. 23.2A, B, C) strike with an open dactylus, impaling prey—soft-bodied animals like fish, cephalopods and shrimps—on a row of sharp spines. 'Smashers' (Fig. 23.2D, E, F) strike with the dac-tylus closed against the propodus. The outer edge of the dactylus is a calcified heel, used like a hammer to smash open hard-bodied prey such as crabs and snails. The power of the raptorial strike can be lethal—the force of the impact may approach that of a small calibre bullet. So, in 'smashers', the raptorial claws are used not only for hunting, but also to avoid unnecessary confrontations. Many 'smashers' have evolved elaborate threat displays that involve lunging and spreading the limbs to display a coloured 'meral spot' on the inner surface of the raptorial claw (Fig. 23.2F). The intensity of the display and brightness of the 'meral spot' varies between species, and gives a potential opponent some indication of the ferocity that it might encounter. The powerful raptorial claws of stomatopods are complemented by finely tuned vision. Each eye can be independently rotated and is divided in half by a central band of ommatidia. This provides the stomatopod with binocular vision from each eye, and the central band of ommatidia provides many of the reef species with colour vision and polarising filters. The combination of excellent vision and powerful raptorial claws make the stomatopod an efficient predator of both slow and fast moving prey. Almost 500 species of stomatopod are known worldwide and more than 90 from GBR waters. Many new species await scientific documentation, especially small species that live deep inside rock and coral crevices. Around Lizard Island, almost 30 species are known. The most common stomatopods among rubble and corals are 'smashers' of the superfamily Gonodac-tyloidea. Common gonodactyloid genera on the reef flat are: Gonodactylellus, Gonodactylus, Gonodactylaceus, Chorisquilla and Haptosquilla. Haptosquilla glyptocercus and H. trispinosa, both with striped antennae and not exceeding about 40 mm length can be seen on the reef flat peering out of circular holes in reef rock. 'Spearers', primarily members of the Squilloidea and Lysiosquil-loidea, burrow in the sand and sediment of the reef flat and on the seabed of the lagoon and between reefs. Several species of squilloid are commercially harvested, taken as trawl bycatch (e.g. Harpiosquilla harpax and Oratosquillina spp.). On the reef flat, the very large piscivore, Lysiosquillina maculata (up to 385 mm long), lives in mated pairs in deep, vertical burrows, with burrow entrances almost 100 mm across (Fig. 23.2B). Lysios-quillina maculata is the largest known stomatopod, with a body marked by bold, light and dark transverse bands. Pseudosquilla ciliata, another common spearer, burrows in seagrass beds or under rocks on the reef flat, and ranges in colour from bright yellow or dark green to mottled green and grey (Fig. 23.2A, C). On the reef slope, the number of species increases, and some of the most spectacularly coloured stomatopods, those of the 'smashing' genus Odontodactylus, can be seen walking out in the open (Fig. 23.2E).